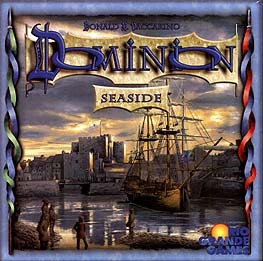 Overall, 'Seaside' is an enjoyable expansion to Dominion. It's one of the stronger add-ons. There's a good mixture of careful, deliberate planning and handling unpredictability in the play and deck building. The theme - involving ships, islands and pirates - is very nice and well done in a cosmetic sense but it doesn't directly affect the game. Seaside introduces the 'Native Village' mat and tokens for the 'Embargo' and 'Pirate Ship' cards. The Seaside expansion is the first introduction of the orange duration cards: events which stay out in front of players and have an impact on the next turn. This is an innovative and welcome idea. The expansion doesn't, however, address the basic, insoluble faults of play imbalance in the Dominion system. Perhaps the best example is the 'Wharf' duration (orange) card, which gives +2 cards and +1 buy both in the current turn and the next. It's too powerful a card and its cost doesn't reflect its strength. 'Treasury' is another overpowered card. I didn't enjoy some of the suggested sets of 10 (i.e., the scenarios) from the booklet, which became frustrating and irritating to play for this reason. I really like the underlying concept in Dominion but the weaknesses take away from the potential enjoyability of constructing decks; there's often no incentive to buy some of the weak(er) cards in the scenarios. Surely the premise of expansions for deck-building games should be that any card can be a worthwhile buy, in the right context? We tried sets of 10 with Seaside cards only, though, so it may be advisible to play the sets mixing Seaside with cards from the Base (Starter) game.